Product prices and availability are accurate as of 2019-04-20 16:23:03 UTC and are subject to change. Any price and availability information displayed on http://www.amazon.com/ at the time of purchase will apply to the purchase of this product. 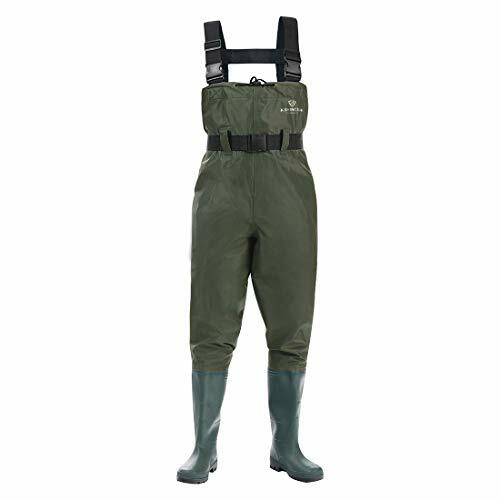 FISHINGSIR KeepDry bootfoot cleated chest fishing wader is made with RUGGED nylon with two-ply upper fabric, we guaranteed the Water Intrusion Resistance processing will help prevent water and dirt from getting into your wader. 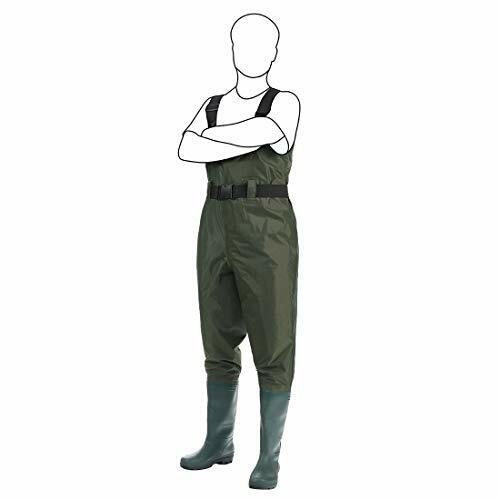 This nylon wader provides a great value and is designed to handle even the toughest work and play situations. It is great for fishing adventures, hunting, farming work, or any messy situation. Perfect Thanksgiving, Birthday Christmas Gift for fisherman. And, 100% satisfaction guaranteed! Always keep these two rules in mind when wading in any body of water: wade with caution, and wade with care. There are obvious and not-so-obvious dangers inherent with wading. Following these tips will help you experience a safe and enjoyable trip. *In rivers and streams, identify potential dangers down current such as waterfalls, log jams, or undertows before entering the water. *Walk slowly, smoothly, and carefully. *Wear a personal floatation device. *Be aware of tides, currents, and water level changes. *If you fall, don't panic. Don't fight the current, work with it. Allow the current to drift you downstream as you work your body towards the bank. *Never continue wading if your waders are full of water. PLEASE Mind the Size Chart and Choose the RIGHT Size Before Buying! KeepDry Bootfoot Cleated Chest Waders come back strongly with expected affordable innovations this season. 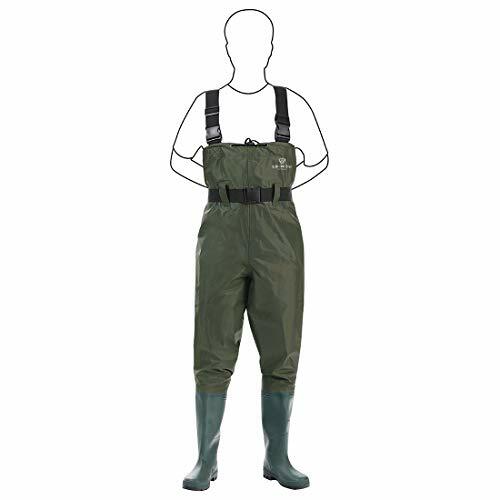 KeepDry Chest Waders was made of upgraded next generation nylon with two-ply waterproof fabric. 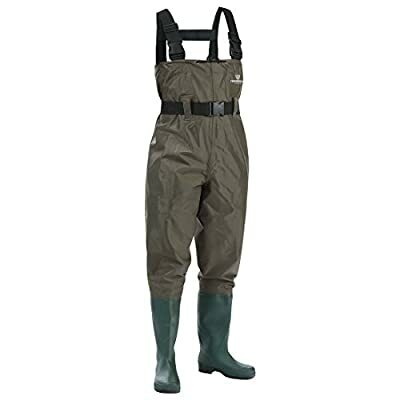 It is rugged and much softer, it was laboratory approved up to 10% lighter than traditional nylon waders in nowadays market; Laboratory approved this next generation nylon fabrics feature a great knitting density performance, it is about 2.5 times higher than common nylon in every square inch. 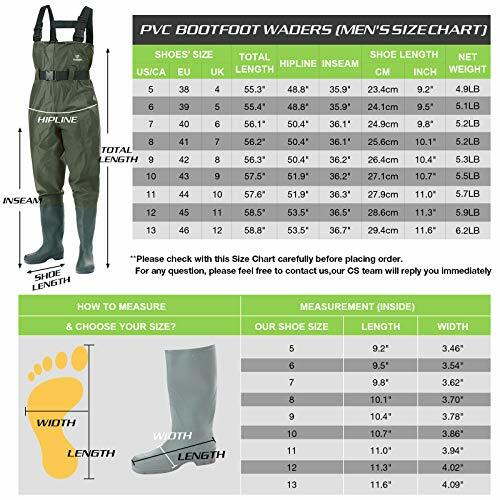 This made the KeepDry@ waders rugged with soft touching feel than ever before and it helps our buyers maximize their time spending on the water; Next generation nylon PVC upper with waterproof boot attachment and visible taped seams, we are so sure the Water Intrusion Resistance processing will help prevent water and dirt from getting into wader. Every KeepDry@ Chest Waders is turned inside out, filled with water, proven leak free, and then hung to dry. The wader is now ready to be shipped; Go on! 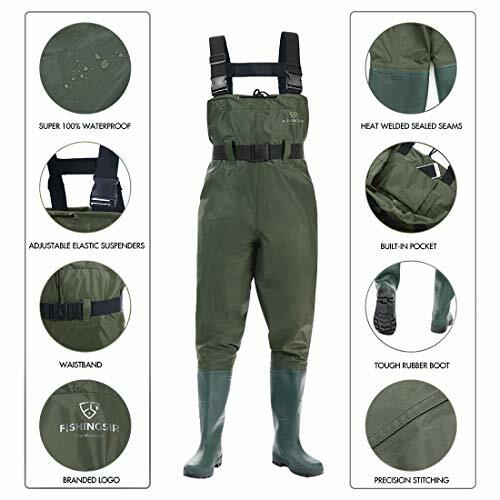 KeepDry Chest Waders also has a dream-team list of features starting with H-back adjustable suspenders, high-quality quick release buckles for easy take it on/off; 2 front D-rings for accessory attachment; built in flip-out chest pocket to organize personal belongings; FISHINGSIR KeepDry Chest Waders was designed to keep dry and warm, handle even the toughest work and sport situation. It is best for fishing adventures, hunting, farm working, or any messy situations. We love our buyers; the waders will come with one FREE water-proof phone case and one year quality assurance backed by us.